Ben and May Parker are Peter's closest relatives, and surrogate parents. They took Peter in when he was a boy, after his parents were called away on a trip from which they never returned. Wow, is the new movie really going to do the "Richard and Mary Parker were Agents of SHIELD" thing from the comics? Because ugh. (But only not actually SHIELD, since Sony can't use any of those characters). Anyway, this is the first toy there's ever been of Uncle Ben, which is itself pretty impressive. 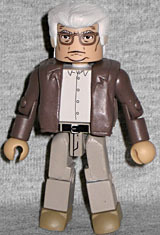 Ben was played by Martin Sheen in his second comicbook role, and the figure really looks like him. Or maybe like Joe Estevez. 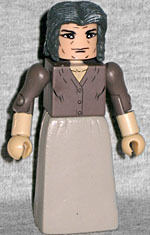 So you could either make a custom of President Josiah Bartlett from The West Wing... or Joel from Werewolf. Either way, he looks appropriately avuncular. And if Ben looks avuncular, then May looks materteral. We'd copy her back-of-the-box bio, but it's identical to Ben's. That's fine, since the text denifinitely applies to both, but it does seem like they could have individualized them a bit more. Aunt May was played by Sally Field, and if you know that ahead of time you can sort of pick out a likeness to her, but it's not strong enough that you'd recognize her without prompting. Her grey hair hangs down, rather than being pulled up in the traditional bun. It's less iconic, but more natural, so she looks like a human being, not like a cartoon. Both Ben and May are dressed in earthtones; or maybe they're supposed to be sepia, to suggest simpler times. At first, the New York City police department sees the vigilante Spider-Man as an annoyance, but when they attempt to unmask the hero, not even a squad of officers can keep him in custody. 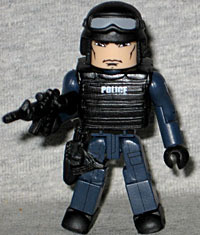 It may not seem to make a lot of sense to pair the kindly old married couple with members of the NYPD SWAT ESU team, but remember: May is the variant of Ben, so if you buy both you're doubling up on the armybuilder figure, not something more specific. The officer is wearing a helmet cribbed from the MAX Search & Rescue team, a bulletproof vest, and has a pistol holstered on his right hip. He also includes a Colt M4A1 Carbine. The name "Lizard Trooper" could easily just mean "Trooper who goes after the Lizard," the same way a police force's "drug agents" aren't necessarily hopped up on goofballs. But no, it's apparently something that earns this toy a spot on our list of spoilers on toys, because he comes with a second head that shows him growing green scales. He looks good both with or without the helmet (as long as you're okay with him being bald), and if you remove the vest there's a plain police uniform beneath it.